Stars are incredibly big and incredibly far away. There is no way that we could measure their temperatures with a thermometer - but still, we can know their temperatures to great accuracy. From experiments on Earth, we know that all hot objects give off light. The objects give off light at many different wavelengths, but each object has a continuum peak wavelength at which they emit more light than at any other wavelength. Notice that because this is an inverse relationship, the longer the peak wavelength, the lower the temperature. Also, remember that the continuum refers to the overall shape of a spectrum. 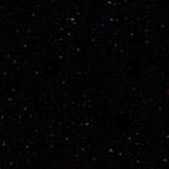 A spectrum that was only due to temperature is shown on the left of the image below; the spectrum of a real star is shown on the right. Look at the spectrum of a real star, shown above and to the right. The overall shape of the spectrum peaks at about 4500 Ångstroms, so its continuum peak wavelength is 4500 Ångstroms. Question 8. Which is hotter: a star that peaks at 5000 Ångstroms or a star that peaks at 6000 Ångstroms? How do you know? Explore 4. Look at the spectra of the same seven stars you saw earlier (page will open in a new window). These are the same seven stars from when you classified by line strength; they are available as a PDF (requires free Adobe Reader). For this exercise, you can ignore the zoom-in beneath each panel. For each spectrum, trace the underlying continuum shape - this is what the spectrum would look like if it had no emission or absorption lines. Find the continuum peak wavelength for each star. If the peak is not shown on the graph then estimate where you think it might peak. Rank the stars according to peak wavelength of each star's thermal continuum, using the table below. Explore 5. Now, use the inverse relationship between continuum peak wavelength and temperature to rank the stars according to temperature. In the third column, fill in the spectral class for each star number that you chose when classifying by line strength; use the current scheme, letters 'A' through 'O'.